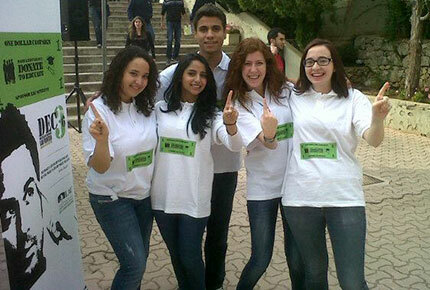 LAU-MEPI Tomorrow’s Leaders students organize $1 Campaign to support access to education. The week-long fundraising activity aimed to support access to education and was part of a larger campaign, Donate to Educate Campaign. The LAU-MEPI Tomorrow’s Leaders program offers financial assistance in the form of scholarship to students from across the Arab world. Click on photo to view pictures. “Making a change” and “creating a better tomorrow” are lofty, albeit worn-out phrases. Yet the LAU-Middle East Partnership Initiative Tomorrow’s Leaders program (TL) are devoting considerable resources and investments toward developing the leaders of the future. Designed to amplify the leadership skills of students, the program places a heavy emphasis on entrepreneurship, women’s participation and civic activism. 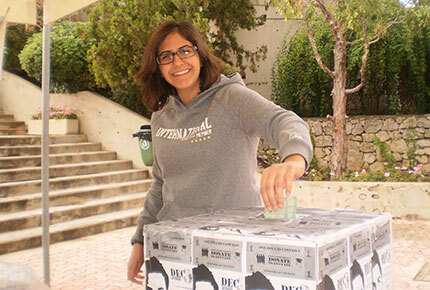 In fact, the program boasts a strong tradition of philanthropy and it was in this spirit of generosity that in early December a group of 25 TL students raised a booth on the sprawling grounds of LAU’s Byblos campus and requested a $1 dollar donation from each member of the LAU community. The week-long fundraising activity aimed to support access to education and was part of a larger campaign, “Donate to Educate Campaign” which began last year by TL students who pledged to donate $5 per month from their stipends for the purpose of educating one fiscally disadvantaged student from the Middle East & North Africa (MENA) region at LAU. Dr. Walid Touma, director of the University Enterprise Office charged with overseeing the LAU-MEPI TL program suggests that perhaps the greatest threat facing the region in the future will be a crisis of leadership. “Universities play a pivotal and fundamental role in remedying this,” says Touma. “The LAU-MEPI TL program is one of the most important investments we can make for the future—today, more than ever we need solid leaders to deal with the massive tectonic changes that are occurring around us,” Touma says with palpable gravitas. “We have accomplished our mission if even one of these students graduates from this program and becomes an effective leader in his or her community,” he adds. “These students recognize their own position of privilege and want to give back—this is exactly the sort of leadership attributes we want to cultivate and enhance,” says Dr. Marwan G. Rowayheb, associate professor of political science/international affairs at LAU Byblos as well as Student Life Coordinator of the LAU-MEPI TL program. Second-year business students Zeina Albitar and Barik Mahadin, led the committee that spearheaded the $1 campaign. “Though the amount we are asking for is relatively small it has a powerful cumulative effect—like a falling row of dominos, a creation of a powerful chain reaction that reaffirms the LAU community’s commitment to access to education,” explained Mahadin. “Giving back is contagious, we have seen much support from the students, staff and faulty in our endeavor,” she enthuses. The LAU-MEPI Tomorrow’s Leaders program offers financial assistance in the form of scholarship to students from across the Arab world. Candidates recruited for program must demonstrate exemplary leadership qualities as well as academic excellence and financial need.